Cleaning has never been an easy task to do around the house. Not only are there tough grimy areas to tackle, it is just too time consuming a chore. It would be great if you could hire a team of cleaners every week and save yourself the time and trouble but that is too expensive for most people. But there is help for the home cleaner- the McCulloch MC1275 Heavy-Duty Steam Cleaner will give you the help you need and speed up those tough cleaning chores that need doing around the house. 2. Squeegee—This is the perfect tool to help you steam clean windows or any other glass surface. Make sure that the glass surface is smooth though if you want a thorough cleaning job. 4. Brass Utility Brush—This feature adds to the versatility of the McCulloch MC1275 Heavy-Duty Steam Cleaner. This little gadget helps you clean bar-b-q grills, hubcaps and many more metal surfaces. 5. Mop Head and Extension Wands—this feature allows you to clean any tile, wood or laminated floor surface in your home. 2. Can I Add Chemicals if I Want?– No. If you add chemicals you may damage the mechanisms. 3. Must I Use Distilled Water?– Again, no. You can use normal tap water but be careful in your use of hard water. Hard water will leave deposits that may damage your steam cleaner. 4. Can I Use This Steam Cleaner to Clean My Carpets?—No. You can only spot clean your carpets. There is no extraction mechanism on the cleaner making cleaning all your carpet impossible. If you are looking for an economical and inexpensive heavy-duty steam cleaner that can do every cleaning job then this is the machine for you. The McCulloch MC1275 Heavy-Duty Steam Cleaner has all the attachments you need to tackle even the toughest cleaning job and its long reach will allow you to clean in rooms where outlets are hard to find. 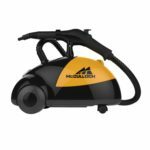 If you have cleaning jobs you refuse to do because they will take up to much time or are too much trouble to clean then you need to go to your local home improvement store and get your McCulloch MC1275 Heavy-Duty Steam Cleaner today. 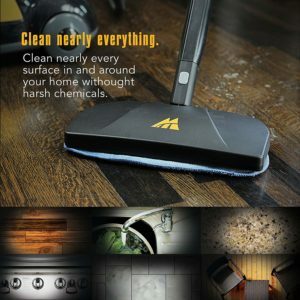 It’s the tool that will solve your cleaning problems.